Osama Bin Laden was, perhaps, the most wanted man in history. For 10 years the manhunt was played out in the world’s media for all to see. What the majority of the world did not see was the raid on the compound in Pakistan, or the events leading up to that point. There are differing accounts from people loosely involved, but most of us will never know the whole truth. Codename: Geronimo is a mostly fictional account of these events. It follows the stories of the key players involved; field agents, CIA analysts and the Seal team that will eventually undertake the mission. Originally titled Seal Team Six: The Raid on Osama Bin Laden, this first played out as a TV movie in the US. Shown prior to the presidential election, conspiracy theorists concluded that the docudrama was a propaganda movie funded by the Obama administration. I failed to see, however, how this movie portrayed Obama as the hero of the day. It is very easy to be sceptical about such a movie, and I certainly went in with a few preconceptions. For one thing, we know the ending, but hey, that didn’t do Titanic any harm. Also, having been put together in the wake of actual events, one could be forgiven for believing that this is a cash cow that will suffer in many areas. Of course, I was also expecting the drawn out, inspirational speeches and flag waving. I’m pleased to say that I really did enjoy this film. Codename: Geronimo did what it set out to do, tell a story, and it did it well. Okay, so the special effects may not have been of the standard of a Hollywood blockbuster, but for a TV movie, they were pretty good. Technically, everything played out as you would expect from a professional production. As a veteran myself, I expected to see plenty of inaccuracies. Thankfully, it seems that the director has listened to the advice of his military advisor, failing to attempt anything too far-fetched to have me shouting at the TV. The principal cast were far from unknown, though the average film goer may fail to be able to name most of them. No issues with the performances here, delivering believable characters and plausible dialogue that the writer can be proud of. My only criticism here would be that there is a lot of unnecessary filler. The principals within the SEAL team all have back stories and we are introduced to their families. There is one montage, going back and forth as they each Skype their loved ones. This does break the pace a bit and I wonder if we needed to be treated to this. After all, I don’t really think that this will be establishing characters for any sequels. The events play out to the inevitable conclusion. There are no real revelations here; it is as we know it. I think the film makers have been quite objective with the material, with only a nod that perhaps the Pakistani government were complacent in sheltering Bin Laden. 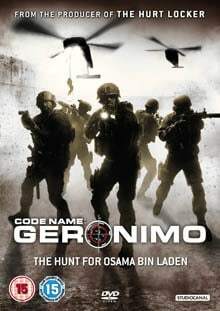 It’s worth noting that Codename: Geronimo is billed as “from the producers of The Hurt Locker”. January sees the theatrical release of Zero Dark Thirty “from the writer and director of The Hurt Locker” another take on the same events. It will be interesting to compare the two. Until then Codename: Geronimo is an easy and enjoyable watch.